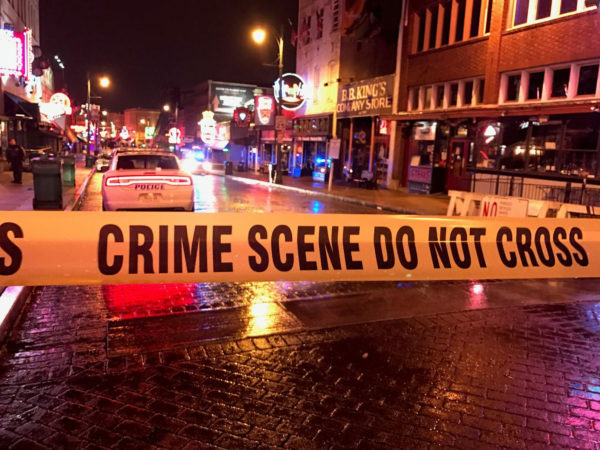 We turned on the news shortly after waking up this morning to hear that 2 men were shot outside a club a 2nd and Beale Streets. About 10 shots fired, and the men were not fatally shot. Wow. The shooting took place over by the police car. The restaurant we were in 12 hours earlier is on the far right. Sad to say, but even Lauren mentioned that we should be careful in Memphis. We haven’t quite felt safe, all along, and thankfully, our awareness has been heightened since arriving. Other than that – the large bags were packed and put next to our door for pickup after 8am. We went down to the Heritage Meeting Room for a large buffet breakfast for all the passengers – standard fare. As Barry pointed out, there was one common demographic – it’s an older crowd. At our table, we had two sisters, originally from Cleveland, OH, who migrated to Southern California to do a one year stint – and ended up getting married and settling out there. The other couple was from Long Island, New York. Barry casually dropped what I’ve termed a “Trump Grenade” – a question about Trump’s election in a public setting, and that started an interesting discussion. The Long Islanders are staunch Democrats, and the sisters openly voted for Trump. We escaped without incident. Next, we checked-in at the meeting room off the lobby for the “Commodore” guests, those with suites on the boat – I here there are about 12 suites. The person checking us in is a masseuse, not licensed to to nails or hair, on the boat, who’s been with the company since July. She took our credit card, pictures and issued us our ID card for the boat. And, reminded us that the city tour / including Graceland meets in the lobby at 10:45. We maneuvered to near the front of the line and were assigned to the hot pink bus, number LM435 for the tour. The first 6 rows of the bus were designated for the mobility challenged crew, but “Flying Gazelda”, Marion, sacrificed herself and landed us some good seats. We didn’t actually end up with any of the significantly mobility challenged on our tour, but… we have some on the cruise. First stop, Graceland. Clouds and rain were looming and we actually had periods of rain and showers during the Graceland tour. You can’t help but be impressed by Graceland, still decorated from the period Elvis lived there, which takes you back to the 60’s and 70’s. They handed each of us headphones and an iPad, and turned us loose. Both the program on the iPad, and the house / grounds / outbuildings, and grounds were well done! All the gold records, all the awards, all the movies, his charitable giving, his music, his friends, the subplots, the memorial garden – remarkable, and to die at 42, was far too young. We even toured one of his two airplanes, the Lisa Marie, and the Automotive Museum. Cadillacs, Lincolns, Mercedes, motorcycles, tricycles, etc, were all on display. And then, we had grilled banana and peanut butter sandwiches, Elvis’ favorite, and a chocolate milkshake for lunch (and the ladies did the shops) before boarding the bus to continue with the City Tour. It was pouring outside! While the busses follow us down the Mississippi and meet us at each stop, there is a new team of local guides (some professional, some not) that lead us through the local sites. Our guy for Memphis had lived there 30 or more years and was a died in the wool Memphis resident. It was a bus-only tour, and we looped through and through the city, catching all the highlights and history. While I have absolutely no desire to relocate to Memphis under any conceivable circumstance, our guide did an excellent job of showing us the brighter side of the city. Our tour ended with the bus crossing the bridge to Mud Island, which has recently been developed with exclusive housing, etc. It was raining, of course, but there was the American Queen – landed on the shore and tied off to a tree – yes, that’s right. Our big bags were hopefully sitting in our cabin, so we just had to get ourselves down the bank to the gangway and board with our carry-on luggage. We wandered up to Suite 503, and loved it. The big suites, 501 and 502, are on the bow, and 503 sits next – on the starboard side. Antique furniture, unique to our Suite, the Natchez Suite, has a king size bed, love seat, dresser with large dresser mirror, and various side tables, veranda doors to the deck, a bathroom, small but very comfortable, a makeup sink and mirror, and tons of hanging and drawer space – with wine and fruit bowl, and a steward, waiting for us. Cool. We unpacked our bags and tucked them under the bed, and waited for the muster drill. Our steward told us that due to the weather, we would merely have to put the life jackets on and stand outside our rooms on the inner hall. After the signal, we went outside our room, got inspected, and he pointed out where we needed to be in the event of a real emergency – roger that. Dinner followed. We are assigned to table 70 for the early seating (5pm). Dinner was good angus beef, etc. and lots of wine and various goodies. We don’t go hungry and we like the team that handles our table. After our dinner, we wandered to the theater for “Elvis, the early years”, with the Andy Childs band. Andy is not an Elvis impersonator, which I actually appreciated. He is a singer/guitar player who can sing like Elvis, but mixes in his interviews with Elvis team survivors and interviews and background on what was going on at the time. The evolution of Elvis, the entertainer. The show was only 45 minutes, but it was very entertaining, and we were looking forward to the next installment. Oh, and by-the-way, the boat unceremoniously got under way somewhere around 5:30. Crystal Cruises played Louis Armstrong’s famous song “xxxx” when starting a cruise, but this was passive. But, we are on the might Mississippi River for the next few days!